The maintenance of sufficient mean arterial pressure (MAP) is important for all patients in intensive care but for neurosurgical patients after SAH or TBI it is essential to avoid secondary brain damage or delayed ischemia. So far most neurosurgical intensive care units use intracranial pressure (ICP) and cerebral perfusion pressure (CPP) as therapy guidance for those patients. Use of fluid resuscitation and catecholamines is standard to achieve CPP between 50-70 mmHg. But sometimes catecholamine-refractory hypotension occurs. In those cases, arginin-vasopressin (AVP) might be the drug of choice. AVP and its synthetic analogies are widely used in modern medicine and gained interest in treatment of septic shock or refractory hypotensin after cardiac surgery or hypovolemic shock. Recent papers also showed a significant impact of AVP in resuscitation after traumatic brain injury (TBI) and influence on CPP in TBI patients during ICU treatment. But litttle is known about the effects of AVP on cerebral perfusion and oxygenation. The present preliminary study was carried out to examine the influence of AVP administration on cerebral blood flow by using the non invasive Quantix ND device. We found significantly increased MAP and CPP but no concomitant elevation in CBF. In contrast, in two patients the CBF even decreased despite elevation of CPP. We conclude that AVP is an alternative drug to maintain MAP and CPP but has to be used with care in patiens with already compromised cerebral perfusion. The means of treatment of ICU patients is to sustain perfusion and O2 delivery to all major organs to avoid organ damage. On neurosurgical ICU the most important factor is to prevent secondary brain injury after traumatic brain injury (TBI) or subarachnoid hemorrhage (SAH) due to ischemia or low tissue oxygenation. To minimize the risk of brain ischemia, standard treatment guidelines have been established including the maintenance of a minimum cerebral perfusion pressure (CPP). The management of CPP normally includes the control of intracerebral pressure (ICP) and mean arterial pressure (MAP), since CPP= MAP-ICP. Despite many clincial trials so far no level I evidence for an ideal CPP exists, but the guidelines of the Brain Trauma Foundation recommend a CPP between 50-70 mmHg in trauma patients, depending on the patient’s individual cerebral hemodynamic profile. For patients suffering from SAH there might be completely different needs for CPP levels since the major cause of death after SAH is delayed cerebal ischemia due to cerebral vasospasm . For those patients a sufficient CCP is crucial. To obtain that CPP, fluid resuscitation can be used but in most patients additionally vasopressors are needed. Today catecholamines are the agent of choice. But with increasing dosage or prolonged duration, side effects like increased heart rate and increased myocardial oxygen consumption occur. The elevation of systemic vascular resistance can also compromise end organ perfusion [2,3]. In addition refractoriness to catecholamines exists . For those patients arginine-vasopressin (AVP) might be the drug of choice. AVP is a hormone that is one of the key players for osmotic and cardiovascular hemostasis. It is syntheszied as a prehormone in the magnocellular neurons of parentricular and supraoptic nuclei of the hypothalamus. It is cleaved into the active hormone and released into systemic circulation from the posterior pituitary gland. The serum levels of this nonapeptide represent the interaction of AVP synthesis, release and metabolism. Arginie vasopressin exerts it’s actions via a variety of receptors. The main three receptors are: AVPR1a (V1 receptor, mainly vascular functions), AVPR1b (V3 receptor, mostly central functions) and AVPR2 (V2 receptor, renal functions). In addition AVP can act via oxytocin receptors as well as purinergic receptors . The V3 receptor is expressed in the hippocampus and the anterior pitutary gland and V3 receptor stimulation by vasopressin leads to a release of adrenocorticotropic hormone (ACTH) and thus interacts with the corticosteroid axis in response to stress such as hypotension [6,7]. The regulation of the vasoconstrictive effects of AVP is an interplay of various actions and receptors. AVPR1a, a G-protein coupled receptor, is the main effector for the AVP associated vasoconstriction and is expressed on the vascular smooth muscle cell, platelets and hepatocytes. It stimulates a phosphatidyl-inositol-calcium signal pathway leading to smooth muscle contraction . But on the other side AVPR1a stimulation also causes production of nitric oxide, a potent vasodilator in pulmonary  and coronary vessels . Also the stimulation of oxytocin receptors by low dose vasopressin can induce vasodilation . Due to the mostly independently regulated pathways of the different AVP receptors, synthetic agonists of the AVP receptors are routinely used in modern medicine, e.g. desmopressin, a V2 receptor agonist is used in diagnostics and treatment of diabetes insipidus or used for treatment of coagulopathies . Vasopressin or terlipressin are used in postoperative bowel distention or refractory hypotension after cardiac surgery . AVP gained more interest over the years in treatment of vasoplegic septic shock or other forms of refractory vasoplegic catecholamie resistent shock. AVP can restore vascular tone by at least four different mechanisms  activation of AVPR1a, modulation of NO, modulation of ATP-sensitive K+channels and potentiation of adrenergic vasoconstrictive agents. A review of literature by Russell  showed that in patients with septic shock the use of low dose vasopressin combined with corticosteroids had a better patient outcome than norepinephrine and steroids. But it can have severe side effects such as peripheral ischemia or disturbances in microcirculation. Despite the fact that studies clearly showed that AVP is safe to use and can have beneficial effects in septic shock or in traumatic shock resuscitation when combined with low fluid resuscitation [14,15] so far validated recommendations in clinical guidelines for the use of AVP in either septic shock or resuscitation fail to appear. The use of AVP in neurosurgical or neurological patients is even more controversial. After brain injury vasopressin is released leading to inflammatroy reactions and cerebral edema. Use of AVPR1a antagonists led to attenuation of secondary brain lesion and edema [16,17]. Interestingly in a model for blunt trauma to the head and chest showed that the use of AVP was as effective as phenylephrine to maintain CPP but improved ICP and cerebral tissue oxygenation . In 2013 Van Haren et al. published a paper concerning the use of vasopressin for CPP management in patients with severe traumatic brain injury. They concluded that vasopressin is safe to use and represents an effective alternative to catecholamins for maintaining CPP. Since the vasocontrictive potency of AVP is well known and the study by Van Haren et al. didn’t measure cerebral blood flow (CBF) or brain tissue oxygenation (PbtO2) the present preliminary study was carried out to evaluate the influence of AVP on CPP, ICP and CBF in neurosurgical patients suffering from catecholamine refractory hypotension. We included 5 patients on our neurosurgical ward in this preliminary study. They suffered either from subarachnoid hemorrhage (4 patients) or severe traumatic brain injury (1 patient) (Table 1). The localisation of the aneurysm responsible for the SAH and severity of the bleeding was documented according to the classification of the World Federation of Neurological Surgeons (WFNS). All patients had continuous ICP and intraarterial blood pressure monitoring to continuously calculate CPP. They received volume and catecholamine therapy according to standard recommendations and in dependance on the occurance of cerebral vasospasm. The goal was to keep CPP > 70 mmHg . The TBI patient was treated according to the Brain Trauma Foundation guidelines. During the ICU stay each of those patients suffered from at least one episode of refractory hypotension that could not be treated sufficiently by volume and cathecholamines. When the decision to try AVP was made a 5 I.U. bolus was applied and the effect on MAP, ICP, d CPP was monitored. The goal was to establish a CPP > 70 mmHg. Since it was a preliminary study we decided to measure CBF non invasively using the Quantix ND device (Cardiosonic Ltd. Israel). The Quantix ND uses an angle-independent doppler technique that employs two ultrasound heads placed in a defined angle to each other in one insonation probe (Figure 1), projecting the actual flow diagrams on a real time monitor. After placing the probe in the submandibular region of the supine positioned patient, the interna carotid artery (ICA) is located by identifying it’s specific flow diagram on the real time monitor. On the real-time monitor the volume flow, both angles (θ1,θ2), the measured diameters oft he vessel (D1, D2), both measured velocities as to the laminar flow (L1,L2) and finally the shear force (Figure 1). This information is continuously stored on the computer and can be later replayed for offline reevaluation. The system was evaluated at our clinic by Rothoerl et al. who compared the CBF values measured by the Quantix ND with rCBF values [20-22]. 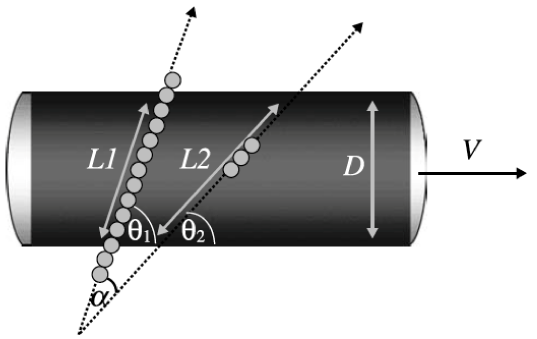 Figure 1: L1= laminar flow doppler beam 1, L2= laminar flow doppler beam 2, D= vessel diameter, V= volume and α = insonated angle. When decision to use AVP in a patient was made, the Quantix ND was used to establish a baseline value of CBF before AVP administration. Additional measurements were performed 2 minutes and 10 minutes after application of AVP. In addition MAP, ICP and CPP was documented at the same timepoints (Table 2). Patient outcome was evaluated at hospital discharge using the Glasgow Outcome Score (GOS). GOS 1 represents death, GOS 1-3 poor outcome and GOS 4-5 favourable outcome. In all examined patients robust CBF values could be gathered at the timepoints of interest according to the standard evaluations of the Quantix ND device [20,21]. In all patients sufficient elevation of mean arterial pressure combined with reduction in ICP and thus elevated CPP could be achieved 2 minutes after AVP administration and was still valid 10 minutes after AVP bolus (Table 1). The mean increase in MAP was 39.2 mmHg and 44.4 mmHg in CPP. In all but one patients this was not paralleled by the CBF. In contrast to increased CPP there was a decrease in CBF in three patients and only one patient showed a significant elevation in CBF (Table 2). Table 1: Demographic data of the 5 patients. Patient 1 was a 57 year old female suffering from SAH WFNS 3 due to an aneurysm of the middle cerebral artery (MCA). On day 5 we couldn’t maintain a CPP > 70 mmHg despite use of fluids and high dose catcholamine application combined with low dose hydrocortisol. The decision to try AVP was made and the reults were controlled with MAP, CPP and blood flow (Quantix ND). Immediately after the application of 5 I.U. AVP the MAP and CPP went up significantly (Table 2) but in contrast the CBF was decreasing. This continued for the next 10 minutes. Therefore no continuous AVP was given. CBF was back to default values 60 minutes after AVP administration. The patient died during the following days due to multiinfarct syndrom as a result of cerebral vasospasm. Table 2: This table shows the values of MAP, ICP, CPP and CBF before (1), 2 minutes (2) and 10 minutes (3) after administration of 5 I.U. vasopressin. MAP, ICP and CCP are measured in mmHG, CBF in ml/100g/min. The second patient was a 43 year old male with SAH WFNS 4. From the beginning of the ICU stay the maintenance of a CPP > 70mmHg proved to be difficult despite standard of care HH-therapy. The first bolus application of 5 I.U. AVP didn’t have any effect but the anew administration of 5 I.U. AVP led to a significant increase in MAP (35 mmHg) and CPP (38 mmHg) but not in CBF (- 1 ml/100g/min). A 48 year female with SAH WFNS 3 (MCA aneurysm) developed hypotension of unknown origin despite use of fluids and catecholamines. Since she also suffered from cerebral vasospasm (transcranial doppler (TCD) values > 200 cm/sec) the need for an additionl vasopressor was given. After AVP administration there was an immediate increase in MAP and CPP. In contrast, CBF values dropped after 2 min but increased after 10 min, though not significantly. Patient was discharged to rehabilitation with a GOS of 3. This 61 year old male was administered to our neuro ICU due to SAH WFNS 1. After being initially stable he suffered catecholamine refractory hypotension after developing pneumonia. He also had signs of cerebral vasospasm (TCD > 200 cm/sec). After AVP administration the elevation in MAP and CPP was significant and accompanied by a drop in ICP. But CBF failed to improve and declined at 10 min after AVP bolus. This patient died at day 14 after SAH due to cerebral herniation as a sequelae of multiple cerebral imfarctions. This 40 year old male was admitted after TBI (GCS 7) and showed a catecholamine refractory hypotension due to sepsis. After AVP administration all recorded values showed rapid improvement including the CBF (+ 12 ml/100g/min). Thus decision was made to continue AVP administration continuously (3 I.U./h). Patient was dicharged after 23 days with good outcome (GOS 4). Due to the mostly independently regulated pathways of the different AVP receptors, synthetic agonists of the AVP receptors are routinely used in modern medicine, e.g. desmopressin, a V2 receptor agonist is used in diagnostics and treatment of diabetes insipidus or used for treatment of different coagulopathies such as von Willebrand disease  or to counteract effets of acetyl salicylic acid . The AVPR1a- agonist vasopressin or terlipressin are used in postoperative bowel distention, refractory hypotension after cardiac surgery  or to treat intraoperative hypotension or treatment of portal hypertension . AVP experienced a renaissance for treatment of hypovolemic or septic shock , refractory hypotension or in resuscitation [12,27]. The finely tuned and independent work mechanisms of AVP on it’s different receptors make it the ideal drug for treatment of patients after cardiac surgery suffering from low systemic resistance concomitant with pulmonary hypertension , since it elevates systemic resistance while parallel decreasing pulmonary hypertension. Those different work mechanisms make AVP a possible target for use in neurosurgical patients. Despite the fact that vasopressin enhances cerebral edema after ischemia [16,29] and also leads to a increased rebleeding rate in an animal model of SAH , some recent studies demonstrated that AVP is safe to use after TBI using the increase in MAP and CPP as endpoints [19,31] or in an animal model where cerebral oxygenation was also studied . But to our knowledge this preliminary study is the first to measure not only the changes in MAP and CPP but put the focus of attention to changes in cerebral blood flow (CBF) after AVP application. In the small number of patients included in our study we could clearly demonstrate a significant rise in MAP and CPP after the application of 5 I.U. AVP. Taken this as endpoint it would appear AVP is a safe to use alternative vasopressor in neurosurgical patients, especially after TBI and SAH, giving the wanted results of an increased CPP. But the problem is the AVPR1a mediated contraction of smooth muscle cells that appears to happen also in cerebral vessels, reflected by the decrease or the lack of sufficient increase in CBF after AVP administration in our patients. This stands in contrast to norepinephrine which elevates systemic blood pressure without normally effecting cerebral vessels, making it the ideal catecholamine for SAH patients. Those findings and our data rise two questions: first -is CPP alone really the ideal target for treatment guideance in TBI and SAH patients and second- is vasopressin safe to use in those patients. The maintenance of sufficient MAP is important in all ICU patients but for neurosurgical patients after SAH or TBI it is essential to avoid delayed ischemia. So far most neuro ICUs use MAP, ICP and CPP to guide their therapy for those patients. This still is considered sufficient, at least in TBI patients according to the Brain Trauma Foundation guidelines. After TBI a dysfunction in cerebral autoregulation might occur  and also the microcirculation seems to be dysregulated leading to distended arterioles (Glushakova et al. 2014 epub) and thus more intracerebral blood volume. As consequence ICP can be elevated. Several studies concluded that a dynamic CPP concept depending on each patient’s cerebrovascular auroregulatory capacities should be followed in ICU care after TBI [33-35]. Depreitere et al also concluded that CPP alone is not sufficient for patient treatment and added the pressure reactivity index (PRx) defined by Czosnyka to their monitoring . In our neurosurgical ICU additional neuromonitoing (PbtO2 and/or CBF) is used in addition to ICP and CPP to steer therapy after TBI. But this is no standard at all since there exists no level I eidence so far that even an ICP/CPP guided therapy has any beneficial effects on patient outcome after TBI. The findings of Van Harren et al. suggest that the distubances in normal autoregulation especially in peripheral arterioles and brain function after TBI are complex and may take effect on various levels. The influence of vasopressin on oxytocin receptors leading to vasodilation  are overridden on a dose dependent manner by vasopressin related activation of AVPR1a and thus vasoconstriction. This might be the reason for the beneficial effect of vasopressin after TBI seen by Dudkiewicz and Proctor  & Van Harren et al. . The AVPR1a activation leads to elevation in MAP and due to constriction of small cerebral vessels to lower intracranial blood volume and thus lower ICP. This was reflected in the results of the TBI patient in our own study. The AVP administraion led to significant rise in MAP, lower ICP value and therefore increased CPP. From the concomitant elevation in CBF we conclude that AVP can at least partly counteract the autoregulatory dysfunction and optimize CPP and CBF without impairment of CBF. Thus AVP seems to be safe to use for treatment of refractory hypotension in TBI patients. It might be even more beneficial than other vasopressors due to its potential effects on small cerebral vessels. Norepinephrine can only reduce ICP when autoregulation is intact, since it has no direct influence on cerebral vessels due to lack of passage through the blood brain barrier . Hence the application of low dose AVP might be superior to catecholamines for ICU treatment of TBI patients with regard to ICP and CPP management when signs of distrubed autoregulation are present. This hypothesis is supported by the findings of Dudkiewicz and Proctor in 2008 who could demonstrate that AVP maintained CPP but improved ICP and cerebral tissue oxygenation better that phenylephrine. In addition there is a new multicenter trial using a drug targeting the disturbed autoregulatory functions of small distended cerebral arterioles. Administration of the test drug ought to lead to small vessel contraction thus lowering ICP. The use of CPP as therapy guidance in patients with SAH is a completely different story. Depending on the severity of the initial bleeding patients can be awake and neurologically assessable or are analgosedated and on a ventilator for extended time periods. Cerebral vasosospasm is still the major cause for mortality and morbidity after SAH. Vasospasm leads to a decrease in vascular diameter hence an increase in cerebrovascular resistance. The decreased bloodflow is often followed by delayed cerebral ischemia leading to catastrophic neurological outcomes or even death. The use of CPP as therapy guidance after SAH is problematic because one can only roughly estimate CBF by the use of CPP since it doesn’t take vessel diameter, restistance or blood viscosity into account. But increased vascular resistance plays the key role in CBF after SAH. We suggest that multimodal neuromonitoring (PbtO2 via Licox/Integra or the Raumedic PTO probe and CBF monitoring by Hememdex probe) should be used in addition to ICP/CPP measurement to optimize ICU treatment and to determine the needed MAP and CPP for each patient individually. This could save volume load and catecholamine administration since the ideal MAP level for each patient could be set (ranges often between 70-140 mmHg). In SAH we use PbtO2 and CBF monitoring regularly and have good outcome results (unpublished data) but so far no level I evidence exists showing that the use of additional neuromonitoring has a significant influence on patient outcome. This is not due to lack of studies but due to the intraindividual variability of patients needs and therefore the difficulties in finding standardized treatments settings that are used in equally in all participating clinics. The maintenance of a sufficient CPP according to dependent variables as PbtO2 and CBF is normally done using HH therapy (hypertension and hypervolemia). In cases when catecholamines are not sufficient or catecholamine refractory hypotenison occurs, AVP could again be the drug of choice due to its vasocontrictive effects. But our data clearly demonstrated that the increased MAP combined with decreased ICP leading to elevated CPP was not accompanied by a concomitant improvement of CBF in SAH patients. This effect was especially seen in patients with elevated TCD velocities suggestive of cerebral vasospasm. This might be due to the dose dependent effects of AVP. The bolus administration of 5 I.U. vasopressin possibly leads to the stimulation of AVPR1a overriding the potential beneficial effects of oxytocin receptor stimulation and increased NO release. The possible modulation of NO release and thus vasodilation could be a very useful tool for prevention of severe cerebral vasospasm after SAH. New studies allude to the fact that cerebral vasospasm isn’t exclusivley a disease of the larger vessels but might occur at early stages mainly in microcirculation. Terpolilli et al. showed promising data using NO-ventilation to prevent microcirculatory vasospam after SAH (presentation at the 2014 annual DGNC meeting). Since AVP can also modulate and release NO, it could be useful at early timepoints after SAH to avoid occurrence of vasospastic events in microcirculation. But further studies have to be done to exploit this possibility. So far we can only conclude from our preliminary data that AVP is able to counteract refractory hypotension in SAH patients but doesn’t lead to sufficient improvement of CBF. In contrast, in two patients CBF was even decreased after AVP administration despite significantly increased CPP, pointing out that AVP can exert a vasoconstricitve effect on cerebral blood vessels. That suggests that in spite of the beneficial effect on refractory hypotension AVP should be used with retentiveness in patients with impaired cerebral perfusion but further studies using continuous invasive CBF monitoring and more patients need to be done to finally decide the fate of AVP in those patients. In summary we found that AVP is an alternative vasopressor for treatment of refractory hypotension but should be used with extreme caution in patients with impaired cerebral blood flow such as SAH patients. Larger studies have to be carried out to evaluate the safety and efficacy of AVP in neurosurgical patients. Keyrouz SG, Diringer MN (2007) Clinical review: prevention and therapy of vasospasm in subarachnoid hemorrhage. Crit Care 11(4): 220. Albright TN, Zimmerman MA, Selzman CH (2002) Vasopressin in the cardiac surgery intensive care unit. Am J Crit Care 11(4): 326-330. Farand P, Hamel M, Lauzier F, Plante GE, Lesur O (2006) Review article: organ perfusion/permeability-related effects of norepinephrine and vasopressin in sepsis. Can J Anaesth 53(9): 934-946. Yeh CC, Wu CT, Lu CH, Yang CP, Wong CS (2003) Early use of small-dose vasopressin for unstable hemodynamics in an acute brain injury patient refractory to catecholamine treatment: a case report. Anesth Analg 97(2): 577-579. Russell JA (2011) Bench-to-bedside review: vasopressin in the management of septic shock. Crit Care 15(4): 226. Antoni FA, Holmes MC, Makara GB, Karteszi M, Laszlo FA (1984) Evidence that the effects of arginine-8-vasopressin (AVP) on pituitary corticotropin (ACTH) release are mediated by a novel type of receptor. Peptides 5(3): 519-522. Hernando F, Schoots O, Lolait SJ, Burbach JP (2001) Immunohistochemical localization of the vasopressin V1b receptor in the rat brain and pituitary gland: anatomical support for its involvement in the central effects of vasopressin. Endocrinology 142(4): 1659-1668. Evora PR, Pearson PJ, Schaff HV (1993) Arginine vasopressin induces endothelium-dependent vasodilatation of the pulmonary artery V1-receptor-mediated production of nitric oxide. Chest 103(4): 1241-1245. Okamura T, Ayajiki K, Fujioka H, Toda N (1999) Mechanisms underlying arginine vasopressin-induced relaxation in monkey isolated coronary arteries. J Hypertens 17(5): 673-678. Thibonnier M, Conarty DM, Preston JA, Plesnicher CL, Dweik RA, et al. (1999) Human vascular endothelial cells express oxytocin receptors. Endocrinology 140(3): 1301-1309. Akin M (2013) Response to low-dose desmopressin by a subcutaneous route in children with type 1 von Willebrand disease. Hematology 18(2): 115-118. Overand PT, Teply JF (1998) Vasopressin for the treatment of refractory hypotension after cardiopulmonary bypass. Anesth Analg 86(6): 1207-1209. Landry DW, Levin HR, Gallant EM, Ashton RC, Seo S, et al. (1997) Vasopressin deficiency contributes to the vasodilation of septic shock. Circulation 95(5): 1122-1125. Feinstein AJ, Cohn SM, King DR, Sanui M, Proctor KG (2005) Early vasopressin improves short-term survival after pulmonary contusion. J Trauma 59(4): 876-882. Sanui M, King DR, Feinstein AJ, Varon AJ, Cohn SM, et al. (2006) Effects of arginine vasopressin during resuscitation from hemorrhagic hypotension after traumatic brain injury. Crit Care Med 34(2): 433-438. Liu X, Nakayama S, Amiry-Moghaddam M, Ottersen OP, Bhardwaj A (2010) Arginine-vasopressin V1 but not V2 receptor antagonism modulates infarct volume, brain water content, and aquaporin-4 expression following experimental stroke. Neurocrit Care 12(1): 124-131. Ameli PA, Ameli NJ, Gubernick DM, Ansari S, Mohan S, et al. (2014) Role of vasopressin and its antagonism in stroke related edema. J Neurosci Res 92(9):1091-1099. Dudkiewicz M, Proctor KG (2008) Tissue oxygenation during management of cerebral perfusion pressure with phenylephrine or vasopressin. Crit Care Med 36(9): 2641-2650. Van Haren RM, Thorson CM, Ogilvie MP, Valle EJ, Guarch GA, et al. (2013) Vasopressin for cerebral perfusion pressure management in patients with severe traumatic brain injury: preliminary results of a randomized controlled trial. J Trauma Acute Care Surg 75(6): 1024-1030. Rothoerl RD, Schebesch KM, Woertgen C, Brawanski A (2003) Internal carotid artery volume flow correlates to rCBF measurements. Acta Neurochir (Wien) 145(11): 943-947. Schebesch KM, Simka S, Woertgen C, Brawanski A, Rothoerl RD (2004) Normal values of volume flow in the internal carotid artery measured by a new angle-independent Doppler technique for evaluating cerebral perfusion. Acta Neurochir (Wien) 146(9): 983-986. Rothoerl RD, Schebesch KM, Woertgen C, Brawanski A (2005) Ultrasonic blood flow volume assessment in the extracranial internal carotid artery in arteriovenous malformations. Neurol Res 27(2): 209-211. Shortt J, Opat SS, Gorniak MB, Aumann HA, Collecutt MF, et al. (2010) A retrospective study of the utility of desmopressin (1-deamino-8-D-arginine vasopressin) trials in the management of patients with von Willebrand disorder. Int J Lab Hemato 32(1 Pt 1): e181-e183. Kam PC (1994) Use of desmopressin (DDAVP) in controlling aspirin-induced coagulopathy after cardiac surgery. Heart Lung 23(4): 333-336. Gilbert M, Lema G (2011) Vasoplegic syndrome and its treatment with vasopressin during cardiac surgery with cardiopulmonary bypass. Rev Med Chil 139(3): 368-372. Saeki Y, Nagatomi N, Kobayashi T, Hiratani S, Shiomi S, et al. (1991) Effects of vasopressin on gastric mucosal blood flow in portal hypertension. Gastroenterol Jpn 26(Suppl 3): 90-92. Lienhart HG, Lindner KH, Wenzel V (2008) Developing alternative strategies for the treatment of traumatic haemorrhagic shock. Curr Opin Crit Care 14(3): 247-253. Tayama E, Ueda T, Shojima T, Akasu K, Oda T, et al. (2007) Arginine vasopressin is an ideal drug after cardiac surgery for the management of low systemic vascular resistant hypotension concomitant with pulmonary hypertension. Interact Cardiovasc Thorac Surg 6(6): 715-719. Rauen K, Trabold R, Brem C, Terpolilli NA, Plesnila N (2013) Arginine vasopressin V1a receptor-deficient mice have reduced brain edema and secondary brain damage following traumatic brain injury. J Neurotrauma 30(16): 1442-1448. Hockel K, Scholler K, Trabold R, Nussberger J, Plesnila N (2012) Vasopressin V(1a) receptors mediate posthemorrhagic systemic hypertension thereby determining rebleeding rate and outcome after experimental subarachnoid hemorrhage. Stroke 43(1): 227-232. Earle SA, de Moya MA, Zuccarelli JE, Norenberg MD, Proctor KG (2007) Cerebrovascular resuscitation after polytrauma and fluid restriction. J Am Coll Surg 204(2): 261-275. Engelborghs K, Haseldonckx M, Van Reempts J, Van Rossem K, Wouters L, et al. (2000) Impaired autoregulation of cerebral blood flow in an experimental model of traumatic brain injury. J Neurotrauma 17(8): 667-677. Johnson U, Nilsson P, Ronne-Engström E, Howells T, Enblad P (2011) Favorable outcome in traumatic brain injury patients with impaired cerebral pressure autoregulation when treated at low cerebral perfusion pressure levels. Neurosurgery 68(3): 714-721. Depreitere B, Güiza F, Van den Berghe G, Schuhmann MU, Maier G, et al. (2014) Pressure autoregulation monitoring and cerebral perfusion pressure target recommendation in patients with severe traumatic brain injury based on minute-by-minute monitoring data. J Neurosurg 120(6): 1451-1457. Johnson U, Lewen A, Ronne-Engstrom E, Howells T, Enblad P (2014) Should the neurointensive care management of traumatic brain injury patients be individualized according to autoregulation status and injury subtype? Neurocrit Care [Epub ahead of print]. Strandgaard S, Sigurdsson ST (2008) Point: Counterpoint: Sympathetic activity does/does not influence cerebral blood flow. Counterpoint: Sympathetic nerve activity does not influence cerebral blood flow. J Appl Physiol (1985) 105(4): 1366-1367.